Varna wants to live in a world where kindness and intelligence reign. A researcher by trade, she’s fascinated by human beings, wombats, velociraptors and other queer creatures, in that order. When she’s not working on her day-job, PhD, son, photography-firm, part-time projects or any of her other gazillion pursuits -- you can find her curled up by the window, watching leaves fall or howling at the moon. Times like this, when Arnab Goswami (who is the self-proclaimed modern messiah of great journalism), is trying very hard to prove that the ‘anti-corruption‘ movement in India is now going international – leave me rather astounded. And frankly, I’m not astounded at anything new. People love causes. Wearing pretty T-shirts with snazzy ‘anna’ slogans, a couple of afternoons out in the sun, the excitement of ‘hey I’m being arrested’ can all be very exciting. Also very juvenile – but never mind that. Here’s the real question, does more litigation/the enactment of more laws solve corruption? The best question is however this; is corruption even a problem? Of course, this is a terrible question to be asking. It surely means that I must be corrupt, support corruption or at any rate be unwilling to do my bit to ‘root-out’ the unforgivable sin of corruption. I’m going to go out on a limb and say yup, all of those things are true. Here’s why: Of course I am corrupt, like every other Indian I have been part of a system that has forced me to, against my wishes (nobody likes to part with money, nothing to do with nobility), to pay a bribe in order to get the job done. Of course its wrong and it doesn’t matter that if I hadn’t paid the bribe, I wouldn’t have gotten a passport. I do support corruption, in that — my understanding of it being a ‘problem’ is completely different. Am I unwilling to do my bit to ‘root out’ corruption, yes absolutely – because the movement is ill-conceived. To begin with ‘corruption’ is not a problem, its a symptom of a larger problem. By waging war against a symptom, one isn’t really sorting anything out – the disease you see, is still around. In this case, the disease is poorly-designed incentives. The idea of a ‘Jan Lok Pal’ is flawed and profoundly misunderstands the causes and solutions of corruption in India. It seeks to create another chunk of Government, more processes and rules, to solve a problem that, in part, exists because of too many chunks of Government, too many processes and rules. If the ‘Jan Lok Pal’ presides over the same system that has corrupted civil servants, politicians, anti-corruption watchdogs, judges, media, civil society groups and ordinary citizens, why should we expect that the ombudsman will be incorruptible? Because the person is handpicked by unelected, unaccountable ‘civil society’ members? Those who propose that Nobel Laureates (of Indian origin, not even of Indian citizenship) and Ramon Magsaysay Award winners should be among those who pick the Great Ombudsman of India — who is both policeman and judge — insult the hundreds of millions of ordinary Indian voters who regularly exercise their right to franchise. For they are demanding that the Scandinavian grandees in the Nobel Committee and the Filipino members of the Magsaysay foundation should have an indirect role in selecting an all-powerful Indian official. The argument that people should be involved in drafting legislation is fine, even if it misses the point that the Government is not a foreign entity but a representative of the people. It is entirely another thing to demand that the legislation drafted by an self-appointed, unaccountable and unrepresentative set of people be passed at the threat of blackmail. If we must have representatives of the people involved in law-making, we are better off if they are the elected ones, however flawed, as opposed to self-appointed ones, whatever prizes the latter might have won. The ‘Jan Lok Pal’ will become another logjammed, politicised and ultimately corrupt institution, for the passionate masses who demand new institutions have a poor record of protecting the existing institutions. Where were the holders of candles, wearers of Gandhi topis and hunger-strikers when the offices of the Chief Election Commissioner, the Central Vigilance Commissioner and even the President of the Republic were handed out to persons with dubious credentials? If you didn’t come out to protest the perversion of these institutions, why are you somehow more likely to turn up to protest when a dubious person is sought to be made the ‘Jan Lok Pal’? But this is us. Given this reality, the solution for corruption and malgovernance should be one that does not rely on the notoriously apathetic middle classes to come out on the streets. The solution is to take away the powers of discretion, the powers of rent-seeking from the Government and restore it back to the people. This is the idea of economic freedom. Societies with greater economic freedom have lower corruption. I have long argued that we are in this mess because we have been denied Reforms 2.0. So here’s the solution; don’t keep adding layers upon layers of legislation!! In the meantime, if you are pro-Anna – consider this. What should you be supporting? Well-designed policy or one man holding a government to ransom? For further reading consider reading: Why the Lok Pal is a bad idea. When Mallika Sarabhai says that “we live in the most exciting times for democratic India, at least in the last two decades”, I wonder what she is referring to? The fact that so many Indians think turning out in hippy t-shirts singing songs is the equivalent of a movement, or that the stalwarts of this ‘movement’ consider it to be truly ‘mass’ given that all of India has internet connectivity (sic), or the fact that India’s need for heroes (read Anna) has grown so much that we should consider this the greatest signl of a fantastically dynamic democracy. The nature of pain (physical) is rather uninteresting. If you’re conscious you can bear it, if its unbearable then you’re probably not around to feel it anyway. Psychological pain, by contrast, is extremely interesting. People hurt each other all the time and the nature of pain differs each time. I’ve learnt recently, for example, that when I’m accused of overspending it results in a kind of blinding flash of pain in the middle of my forehead. However when the accusation is say – not doing enough around the house the pain is more of a traveling headache. This is interesting given that there is probably some connection, between what the mind/brain perceives as a grater insult and the amount of pain one feels. Does anyone know anymore about the subject? 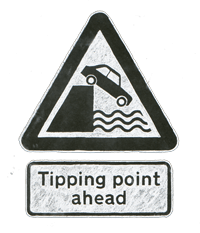 Disclaimer: This post has nothing to do with Malcolm Gladwell and his book – Tipping Point, which is a fantastic read btw. Its been a long long long time since I’ve written anything – really this space is an apology of a blog in that sense. I do have an excuse to offer though. Actually a string of excuses – the first being that I don’t have a job and went through a major phase of depression, then I got married and lately I’ve been spending time with a critically ill family member in a hospital instead of honeymooning. Between all of this, I’ve had plenty of time (what else does one do in hospitals and beauty parlours anyway?) to introspect and more interesting observe my own behaviour during these tumultuous times. I find that dealing with a crisis if you’re an overall efficient person isn’t very difficult. All it requires is a clear head, a larger than normal supply of patience, access to money and someone loving who will take care of you while you take care of other things. Its the little things though that happen throughout that is truly exhausting. It didn’t matter so much for example, that I had to find 16 people to donate blood at a short notice or find ways to deal with extreme cultural shocks. It bothered me terribly though – that my favourite hair brush vanished for three whole days. It drove me to tears when I couldn’t find bathroom slippers in order to go pee when I had Mehendi on my hands. I’m not sure what explains the complete strangeness of this behaviour – but on a completely non-original note I think I can say I’ve discovered my own Tipping Point. I hate it when I am expected to ‘be there’ and ‘take care’ — and the little things aren’t in order. Clearly working to resolve a large crisis (emotional or physical) brings out the best of ‘responsibility’ in me, but perhaps that process is so alien to me that I compensate by stressing out about the small things. Human nature or peculiar to me? 1. Are you being irrational about the little things? 2. Are you doing too much on your own? 3. Are you being a little unfair to those who are in support roles with you? If you’re answering yes to any of these things – do what I did. Recognise that you have a problem. Find out what your tipping point is. Meditate for a bit. Change what gets you to that point. Get on with crisis management. People are often, excited and tremendously, when they find out I work in what we like to call the ‘development sector’. Words like wow, passion, doing-your-bit and such get thrown about a lot. The more I hear stuff like this, the more disconcerted I feel. The ‘development sector’ in India is one of the poorest performing sectors ever. I can make this statement because, the size of the development sector in India has never been accurately measured, there are no meta-analytical studies that estimate its size or ROI and there are only some arbitrary anecdotal pieces of evidence that constitute ‘impact’. Most of these pieces of evidence aren’t based on a standard framework or analysis and so there is no meaningful way to measure improvement. I can also make this statement because – in all my years (which are not those many!) I have met very few people (none actually, but I keep hearing about such people) who are uniquely qualified to work with development. The vast majority of non-profit CEOs are either MBAs or investment bankers. Most mid-management are either engineers, doctors, journalists who decided that it was now ‘time’ to work with development. I’m a staunch supporter of transferable skills. An MBA can bring valuable information about organisational effectiveness (in theory only :P) to an NGO, for example. However, here is my problem. To practice medicine, you need to have had a degree in medicine, to become an advocate you need to demonstrate knowledge of the law. To become an educator or a non-profit professional; you only need to have ‘smarts’ and ‘passion’. Is this the best rigour we can bring to something we consider so important? The point is, the ‘development’ sector is a myth. There really isn’t such a thing. If there were – it wouldn’t be so under-evolved. To see what I mean, consider project management. Project management is an IT curse. It’s a great tool that has been studied and dissected and forced-upon generations of coders for years. Its documented and you can even be a certified professional at it. Anything even remotely close or institutionalised for development? No. Interestingly, nothing has ever been developed in-house. Instead, we know, that the social-sector side of the TATAs likes logic frameworks/models (borrowed from the military), DFID has its own propriety project framework and the rest of us try desperately to capture learning achievement and gender empowerment through PERT charts and Work Breakdown Structures. The truth about the ‘development sector’ in India (and yes I work in it) is that none of us really know what we are doing. Nobody understands what ‘development’ means, what we should measure, how we should measure, what tools we should use and if there is any point at all to doing all that we – in a coherent clear-headed manner. The arrogance is sometimes astounding. And it kills the beauty of making an effort, the process of discovery and the opportunity that those of us who work in this sector have – which is to learn first. I’ve been slow to convert from Firefox to Chrome – despite the fact that Chrome is a lot faster, has more screen-estate and in general provides for a smoother browsing experience. I’ve finally gotten rid of Firefox altogether though thanks to a great little extension called Apture Highlights. Although Apture works for Firefox too, it somehow fits with Chrome being more ‘new generation’. What makes Apture absolutely fantastic is how real it has made the “contextual web” for me. Sure, one doesn’t really need contextual links to save a few clicks. The great thing is that this is how we search for information in the real world — we read something, find something we don’t know about and ask. All without having to do a couple of intermediate steps in the middle. Perhaps the most coolest thing about this feature is the fact that you can also perform Apture searches within Apture content. I suspect most readers are used to following their curiosity through multiple Web searches and pages. 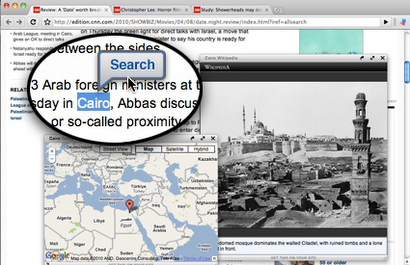 Now you can do that without leaving the page where you started or opening a bunch of new browser tabs. Harris said publishers have found that readers stay on the page two to three times longer after Apture is activated. Try it, it is awesome! I haven’t done an MBA and I definitely don’t know anything about human resource management, but I really think I could write a book about the-art-of-writing-a-resume. I spent my day today looking at potential employees and laughed enough for someone to consider me nuts. 1. Photographs: Unless the application is to a modelling agency, don’t bother. Nobody cares about your face – in particular nobody cares for a full length photograph. 2. References: Do not put down your husband/father/cousin etc., as references and then explain the relationship. In addition to being useless its also stupid. 3. Get the name of the organization right: You cannot apply to the UN when we are not the UN. 4. Referring to your ‘selves’: Avoid talking about yourself in multiples. Its disconcerting. 5. The personal attributes/interests column: If you don’t know how to use it, take it out. Seriously, I don’t care if you enjoy watching NDTV in spare time. Oh sorry, I do care. It means I won’t hire you. 6. Using words you do not understand: If you don’t know why ‘transparency’ is important, don’t use the word. I feel flabbergasted at your stupidity. Especially if you call yourself transparent. 7. Do not beg for the job: Do not say “I surrender my application”. If I wanted ‘surrender’ I would be hiring for love, not work. 8. Cover Letters: If nothing else, write a good cover letter. A blank e-mail with an attachment just shows laziness. 9. If you have no direct experience: No sweat. Just don’t send me a CV with experience in ARM technology and Ghz processors. Tell me instead– why you want to make the switch and what skills you have that are transferable. 10. Don’t be a saint: Just because you want to work with the development sector, doesn’t mean you have to be “selfless in every endeavor”. Saints don’t get things done. 11. Applying for multiple posts: Don’t apply for every post that the organisation advertises. They already have your CV on file once, its only irritating to see the same cover letter/CV five times. 12. Interviews: Give telephone numbers on your CV that work and that you are reachable at. Speak in whatever language you are comfortable in – if English was a requirement, it would have been stated in the job description. When called don’t ask “what company are you calling from”?…have you not been listening?! 13. “Mr.” : Don’t automatically assume your recruiter is a man! 14. FWDs: Do not send an application with “fwd” in the title. Its obvious someone wrote it for you. While you are at it, make fonts consistent.